Memory card slots in mobile phones may soon be a thing of the past. 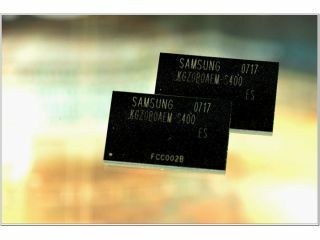 That's if a piece of wishful thinking from Samsung turns out to be true and its new, larger solid-state flash-memory chip takes off. The Korean company announced today that it has developed an industry-leading 4GB multi-chip package ( MCP ) specifically for removing the need for external storage in modern phones. One side effect is that it greatly simplifies the phone design. Not only does the new MCP have a much larger capacity than its predecessors, but it is physically smaller. It simplifies the electronics needed for phone software to address the memory, thus allowing for smaller phones. A previous 8GB chip did not substantially alter internal phone architecture - the major advantage bestowed by this MCP. Samsung director Jim Elliot explained the benefits: "[It] allows handset manufacturers to significantly reduce development time while deploying an extremely robust design that will result in higher performance for smaller phones, with higher storage capacities." That's all well and good for now. But we have a sneaking suspicion that 4GB is going to start looking a little cramped - even for phones - within the next few years. There's always Samsung's 8GB microSD card in that case, eh?